Along my path in the Bujinkan, beginning in 1975, I have experienced and absorbed the nature and essence of Hatsumi's style and his fundamental principles. Doron Navon, my sensei and close friend, who opened the Bujinkan doors for me, provided me with the substantial knowledge and practical experience which constructed the skeleton of my taijutsu. 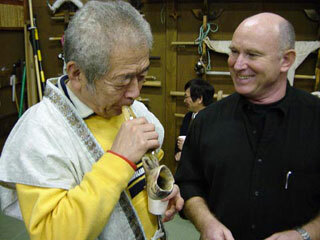 After Doron's retirement, my relationship with Hatsumi strengthened, until one day Soke embraced me as his student. Dr. Hatsumi, the founder of Bujinkan School, carries with him the knowledge of nine ancient martial art systems, passed to him through the warrior and great master Toshitsugu Takamatsu. For some time, Hatsumi taught and guided only a few students in a narrow dojo within the basement of his home. However his proficiency in Ninjutsu ("the Ninja skills") attracted many curious investigators. Within a short time, he gained world-wide recognition. Hatsumi started to travel and teach around the world, mostly in Europe and USA. Amongst his travels he visited Israel twice, for Taikai 1989 & Taikai 1992. Hatsumi declared himself a universal personality (as opposed to being Japanese), and his own definition expresses well his open approach to those who have joined the Bujinkan and to everyone he meets. In 1994 he declared his art Budo taijustu. Today, with a retrospective view of my many professional meetings with Hatsumi beginning 1987, in Japan and around the world, I’m pleased with my tenacity to persevere on this path, though many difficulties stood like walls in my way. Through the progression of my development as a martial artist, I became deeply involved in the genius work, Feldenkrais Method (FM) and became a teacher for this method. 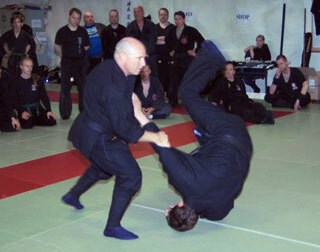 My combined experience in Martial Arts and FM provided me the fundamentals to build a unique training curriculum “Improve Survival Abilities”, further enabling me to explore the relationships between Budo and FM in my thesis “the Fighting Roots of the Feldenkrais Method”.